Sasha and Farley are visiting every night, with Toto and Flynn showing their faces every now and then. Ruby and Wasabi have also been seen but are mostly staying away, hopefully looking after Maple and Clover. Although Flynn is still small and still shares a sleeping spot with Sasha, Sasha is getting less tolerant of him and chases him away from the house when she sees him. Based on past experience, Flynn won't be chased away permanently for another couple of months. 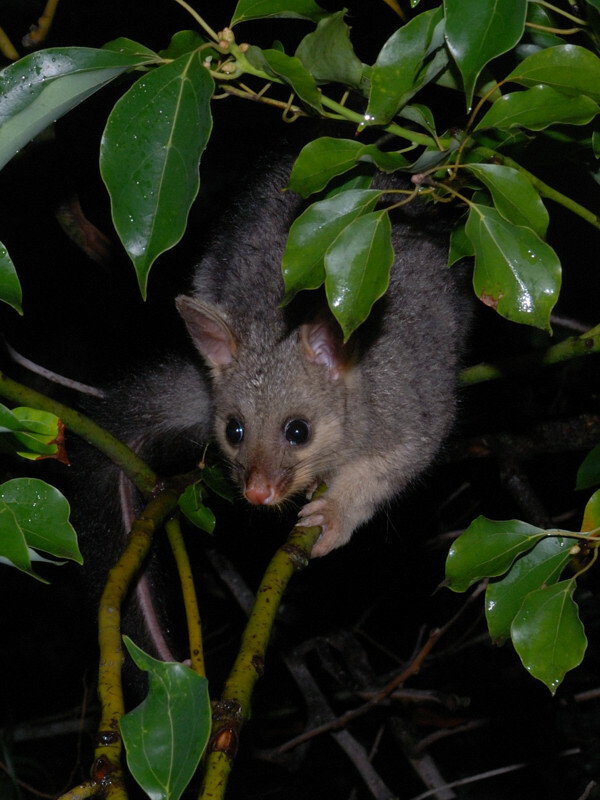 But then again all possums are different and what held true for Kiki's babies might not be true for Sahsa's. Toto has been having a hard time. She gets chased away by Sasha all the time. She doesn't seem to have any injuries, but her babies haven't fared so well. 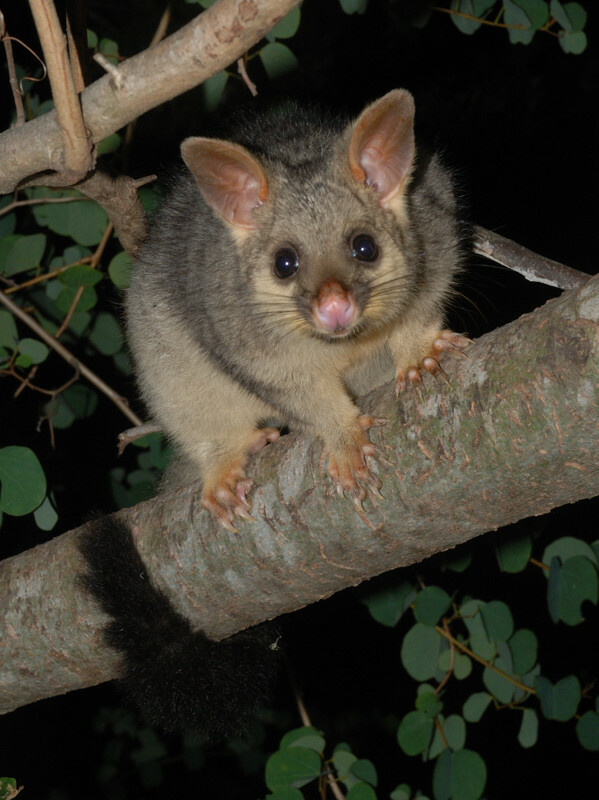 Her first baby disappeared in November of last year when it was still in the pouch. Her latest baby, Puff was not in her pouch the last several times she visited the house and I hold grave fears for its safety. Puff, when barely furred, was found by a neighbour on his doorstep when it had fallen out of the garage door where Toto was sleeping. He phoned me asking what to do about it and I suggested picking it up and putting it back with Toto. He did this and she accepted the baby back. There were also a number of incidents around this time when the baby was left alone by itself in the ceiling space for a very long time and was calling out in distress. This was how the baby got its name. Subsequently, Toto was seen with the baby in her pouch and was also seen with it in Box 1 on the 7th March, so it survived these particular ordeals, however it now hasn't been seen or heard for a considerable time which is cause for some concern. I fear that Toto is being forced to either abandon her babies, or at least leave them alone for extended periods in risky circumstances, in order to survive herself. Here is the best footage I've been able to find of the baby in Box 1. 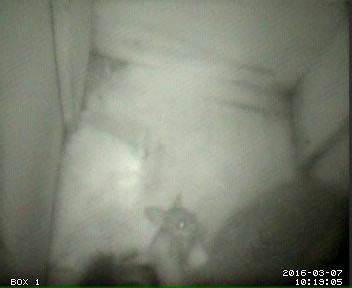 One unfortunately thing is that the day after Toto came into Box 1 with her baby, the Possum TV server failed, so I have no way of knowing whether they continued to use the box. It turns out that the motherboard failed after a power outage. I was away from home at the time and couldn't fix it for nearly a week. When I returned, I managed (with difficulty) to get it running again with a spare motherboard, but it was a clear warning that if I didn't do something soon it would fail in a more permanent way. This computer had been running almost continuously since 2008 and many parts were nearing the ends of their lives. So over the past couple of weeks I've been building a new server and I finally put it into service yesterday. Since it's entirely new hardware and all of the software was upgraded to later versions there are probably going to be a few bugs to be sorted out. Please email me or leave a message on this blog if you see something that's not quite right.